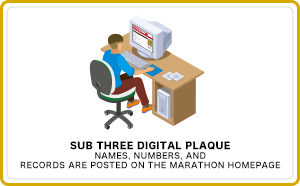 The marathon administration believes in the proper handling of personal information. All personal information will be appropriately handled in accordance with the marathon personal information policy and all related legal rules and regulations. To continue improving the quality of the event, participation data, records, surveys, and related information will be used. ※You may receive communications from the marathon administration or the Kumamoto Castle Marathon Executive Committee regarding the contents of your application. １）No refunds will be issued if the marathon is canceled for reasons beyond the administration’s control. ２）Please ensure that you have done the proper training, received necessary medical examinations, and are in good health before participating in the marathon. ３）The marathon administration is not responsible for any delays due to public transportation or traffic conditions. ４）The competition may be temporarily halted to allow emergency vehicles to pass. ５）Please follow any other instructions given by the administration regarding the marathon. Receipts will not be issued. Please refer to your provider’s credit card statement or bill. Receipts will not be issued. Please use your payment stub as a receipt. ７）Those with sensory disabilities or who would otherwise have difficulties running by themselves are allowed to have one accompanying runner. Service animals are not allowed. This is for runners who have never participated in the Kumamoto Castle Marathon Historical Fun Run before. Runners who have participated in the Recovery Challenge Fun Run, Jokamachi 4 Kilo, or the Kumanichi 30 Kilo Road Race but who have never participated in the Historical Fun Run in the past can still qualify. 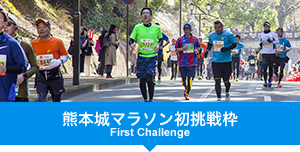 If the number of applications for the Kumamoto Castle Marathon First Challenge exceeds the number of slots (3000), participants will be selected by raffle. First Challenge qualified applicants will have priority. If an applicant is not selected for a First Challenge slot, they will be automatically entered into the general raffle for a second chance at participating in the run. Filing an additional application for this is not necessary. For runners considering their first event, or for runners who have failed to be selected for the marathon, this may be your opportunity. Apply now! Runners who have never participated in the Kumamoto Castle Marathon (Historical Full Marathon) in the past. Runners who have been selected to participate in the marathon but did not run are excluded. ※Past participants are defined as those who have been selected by raffle and then paid participation fees in the past. ※Group applications are not allowed for the Kumamoto Castle Marathon First Challenge. 1.What is the Support Kumamoto Charity Fundraiser Campaign? 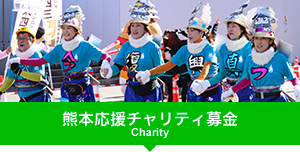 Participating runners in the Kumamoto Castle Marathon will have the opportunity to sponsor a charity. The goal of this program is to support the recovery of Kumamoto, maintain Kumamoto assets, and spread the spirit of charity one runner at a time. All charitable donations will be donated to a chosen fund selected at the time of entry. 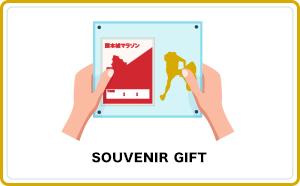 During the entry process, there will be sections to indicate your willingness to participate in the Support Kumamoto Fundraising Campaign and preferred charitable cause. Please specify how many donations you would like to make and the fund you would like to donate to. After runner selection takes place, please include the amount you would like to donate along with your participation fees and system fees to participate in the campaign. ※Each participant is allowed to select only one donation fund to give to. Thank you for your understanding. Runners that donate over ¥30,000 (60 donations) as part of the Support Kumamoto Charity Fundraising Campaign will be exempted from the raffle and allowed to participate in an event of their choice (Kumamoto Castle Marathon, Historical Fun Run, Recovery Challenge Fun Run). ※Participation fees are calculated separately. ※Group entries for this program are not allowed. What is Sub Three Premium? Runners who have completed the Kumamoto Castle Marathon with a sub three hour time during any one of the last five years will be given preferential treatment and placed in the starting block of this year’s marathon. 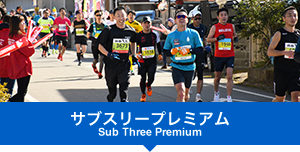 Runners who have qualified for the Kumamoto Castle Marathon Sub Three Premium have their names, runner numbers, and records posted on the Kumamoto Castle Marathon homepage. The ¥500 system fee is included in the numbers listed above. ※1 Time begins when the starting gun is fired. ※2 Checkpoint closing times for the Historical Full Marathon and Kanakuri Memorial Kumanichi 30 Kilo Road Race have been determined based on transportation, security, and operational conditions. The marathon administration may cease competition for remaining runners based on the ceasing of traffic restrictions. ※3 Runners in the Recovery Challenge Fun Run who have yet to pass through the Karashima Park and tram railway area by 9:45 will be retired from the event. Traffic restrictions will cease at 10:00. ※Times are subject to change. 【Payment Example】Applied for and selected for an individual slot in the full marathon and offered to make two donations at the time of entry. ※The system fee for group entries is ¥500 per person. For runners wanting to participate in the fundraising campaign, please include the number of donations you would like to make (¥500 per donation) and include them with your participation fee payment. ※If shirt size is not specified at the time of entry, women will be given an S size shirt, and men will be given an M size shirt. ※There are only limited quantities of each size, so you may receive a different size shirt. Results will be sent out at the beginning of October. For groups, only the group’s representative will be informed of the result. Runners selected to participate (or the representative for groups) must deposit the total payment for participation fees, system fees, and charity donations in the specified bank account by the given date. Non-payment will result in runners’ slots being given to another applicant. ・Individuals and groups may not file multiple applications. Multiple applications will result in disqualification. ・Group applications may be filed for 2〜5 people. 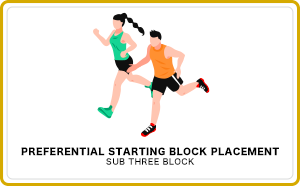 ・For groups, all runners will start in the same block as the slowest member of the group. ・Group members cannot apply as JAAF competitors. 1）The marathon administration is not responsible for any illness, loss, or other accident except to provide emergency services. 2）Applicants cannot change event type or cancel their application at their own convenience after it has been issued. 3）Knowingly producing false information about age or gender, and having another runner who is not the applicant participate in the event is not allowed. 4）Repayments of participation fees, system fees, or charity donations will not be issued in the event of cancellation due to earthquakes, inclement weather, accidents, crime, illness, etc. 5）Repayments will not be issued for overpaid deposits or multiple deposits. 6）The rights to publish and use event media, pictures, records, articles, applicant names, years of age, addresses (country of residence and name of state, prefecture, and/or city) on television, newspaper, magazines, internet, etc. belong to the marathon administration. 7）The marathon administration will handle personal information in accordance with all relevant rules and regulations. 8）This event will take place in accordance with all relevant rules and regulations. 9）In addition to the items listed in this application policy, this event will also be hosted in accordance with the Official JAAF Competition Policies. 10）Legal minors are required to gain the consent of their guardian before applying. 1）Multiple applications by a single applicant will not be accepted. One application is defined as a single individual applying for one event. If it is determined that multiple applications have been made, all applications will be disqualified and any payments made will not be returned. 2）Knowingly producing false information regarding age, gender, records, etc. and having another runner who is not the applicant participate is not allowed. Any applicants engaging in this practice will have their entry revoked and will be barred from any future Kumamoto Castle Marathons. 3）Application information cannot be changed, edited, or canceled once it has been sent. If there is an issue with the contents of your application, the marathon office will contact you at the email address or phone number provided in the application. 4）Raffle results will be sent via email to all marathon applicants, however, if the email address provided is invalid, the marathon administration will not follow-up with the applicant. Only group representatives will be contacted for group applications. 5）Runners may not have a surrogate participate in the event nor may they transfer their entry privileges to another individual. Any runners engaging in these practices will be disqualified. In the event of disqualification, no compensation will be provided nor will repayments be issued. Also, the applicant and surrogate with both be barred from future Kumamoto Castle Marathons. 6）The marathon administration is not responsible for any late applications as a result of internet issues or equipment malfunction. 7）Applicants are required to provide an email address at the time of entry. One contact email address can be registered per applicant. Please prepare an email address before making an application. There may be cases where an application cannot be filed as a result of hardware, OS, and/or browser issues. © Kumamoto Castle Marathon All Rights Reserved.